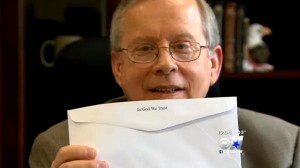 TARRANT COUNTY, Texas — A tax collector in Texas has decided to print the motto ‘In God We Trust’ on outgoing office stationery, generating both support and opposition over the usage of the statement. Tarrant County tax assessor and collector Ron Wright told reporters recently that he has been contemplating printing the nation’s motto on county envelopes for a year, and will soon also add it to the annual tax statements. “All the lawsuits that school districts have had, they’ve sent the message that we’re not allowed to use the word God officially, and of course that’s a mistake because the courts have never said there was a problem with that,” he added to KTRH-TV. He opined that people view the national motto, which was signed into law by then-President Dwight Eisenhower in 1956, in different ways. “One could look at it and see it as a religious statement, and one could look at it as a patriotic statement and not a religious statement at all,” Wright explained. But some who have learned of Wright’s endeavor, which he said only cost $3 to implement, have already taken issue with the concept. Atheist blogger Hemant Mehta also denounced the use of the motto and called upon readers to complain. But others have found no problem with Wright’s decision and are supportive of the idea. “It’s awesome. I love it,” stated two local residents interviewed by CBS 11 News. “That’s what [this nation] was founded on,” another stated. As previously reported, some cities have come under fire for utilizing the motto in recent years, but over 300 municipalities nationwide have decided to adopt it as their own due to the efforts of California politician Jacquie Sullivan. Prominent atheist Michael Newdow also recently sought have the phrase removed from American currency, asserting that it violates the Establishment Clause of the United States Constitution, but the courts disagreed.